Published: Feb. 3, 2014 at 12:30 a.m. 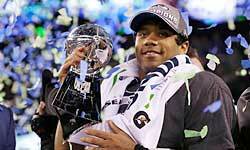 Updated: Feb. 3, 2014 at 03:33 p.m.
EAST RUTHERFORD, N.J. -- The Seattle Seahawks make it hard on sportswriters. Their defense is so incredible at every level that we aren't quite sure where to start. There isn't one All-Pro pass rusher; there are four guys who can create havoc on any play. The Legion of Boom is so deep that two of its players canceled each other out in the Defensive Player of the Year voting. And there were so many candidates for MVP that a backup linebacker like Malcolm Smith somehow took home the award. Sunday's Super Bowl romp was a triumph of four years of planning, building and teaching by coach Pete Carroll. General manager John Schneider had a vision for how to create the best defense in football. That vision was realized Sunday night in New Jersey. In the ultimate pass-first era, Seattle's defense shut down the ultimate passing team. And they made it look easy. "We're the best defense since the '85 Bears," defensive end Michael Bennett said after the game, via CBS Sports' Will Brinson. That's the type of company the Seahawks' defense is keeping now. We will talk about these Seahawks like we do the 1970s Pittsburgh Steelers and the 2000 Baltimore Ravens. By beating a historic offense, the Seahawks wrote a legacy of their own. 1. Denver's offensive line was a disaster. Center Manny Ramirez started the game with an ugly snap that wound up as a safety. Crowd noise seemed to be a factor. (Score one for the 12th man!) Offensive tackle Chris Clark was manhandled a few times by Seahawks defensive end Chris Clemons. Cliff Avril flew around the edge and helped force both of Peyton Manning's interceptions with pressure. 2. It felt like a prayer anytime Manning threw the ball deep. His receivers weren't open, and he rarely was close to being on target. 3. When Manning threw short, the Seahawks' defenders swarmed around the football. Their tackling skills are so underrated. The Broncos couldn't get any yards after the catch. 4. Still, Manning blinked on his first interception. The Broncos didn't have a first down at that point in the game, and he forced a throw that wasn't there because of pressure. The Seahawks made Manning move his feet early in the game. They created their own luck. 6. The Broncos then outgained the Seahawks in the second quarter, 112 to 18. And yet the Seahawks outscored the Broncos in the second quarter, 14-0. Percy Harvin started the second half with a kickoff return touchdown, and the score was up to 29-0 with very little help from the Seahawks' defense. 7. Suddenly, that trade for Harvin doesn't look so crazy. Now they get to enjoy him next season. 8. It was weird and sad to see Manning a little rattled when a reporter used the word "embarrassing" in a question to him. (Wes Welker had called the performance "embarrassing.") Manning had to conceal his emotion. We don't blame him whatsoever, but it is so rare to see from him. "It's not embarrassing at all. I would never use that word," Manning said. "That word embarrassing is an insulting word to tell you the truth." 9. We'll miss Marshawn Lynch for so many reasons. 10. Yes, the Seahawks scored 12 seconds into the first half and 12 seconds into the second half. Football is weird. 11. This was ultimately a disappointing ending to an incredible season. We expected the best two teams in the league all season to produce a memorable Super Bowl. It was memorable, but not for the right reasons. It was a beat down of epic proportions that brought to mind so many ugly Super Bowls from the 1980s and '90s. This game will forever change how we view this Broncos offense. They looked like they didn't belong in this game. On the biggest stage, the Seahawks made Denver look like an also-ran.